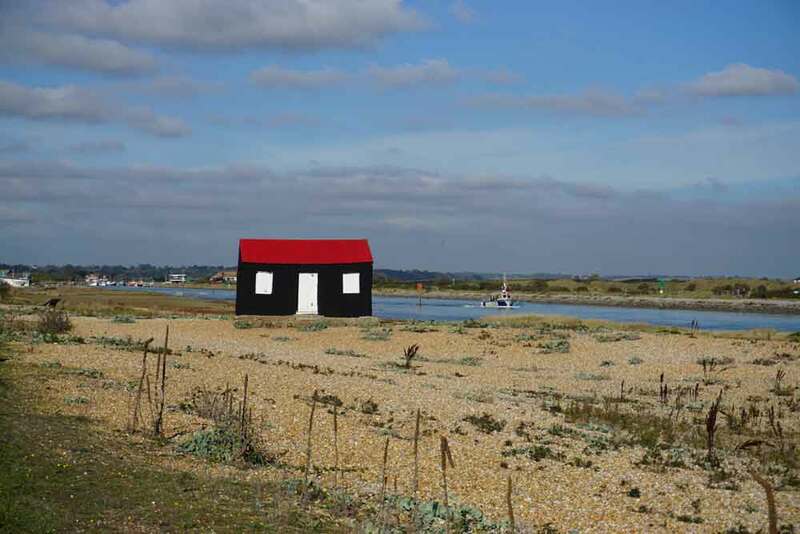 Travels, Travails .. and the trials of Triumph ownership | ….holiday blogs, motoring obsessions and a general account of life in the Ewbank household…..
With autumn fading fast we decided to take the ‘van’ for one last short jaunt to the seaside before putting it to bed for the winter months. As luck would have it we managed to time our trip to coincide with a spell of lovely ‘Indian Summer’ so the countryside of East Sussex looked at its very best. A pleasant drive from home was made a little more exciting by an encounter with a narrow, tree-lined lane that the satnav picked for us; but that aside we managed to arrive at our campsite unscathed. 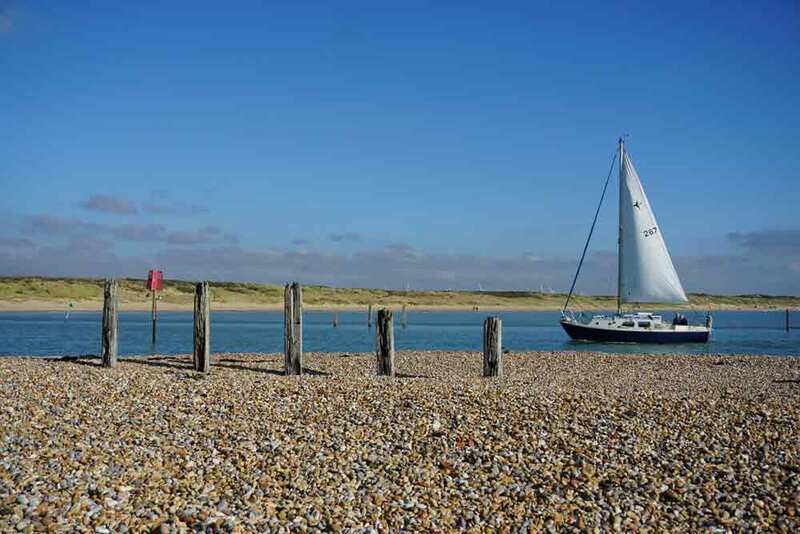 The following day we cycled into nearby Beckley and caught the local bus down to Rye Harbour where we took a stroll down to the mouth of the River Rother and watched the yachts and fishing boats coming and going . 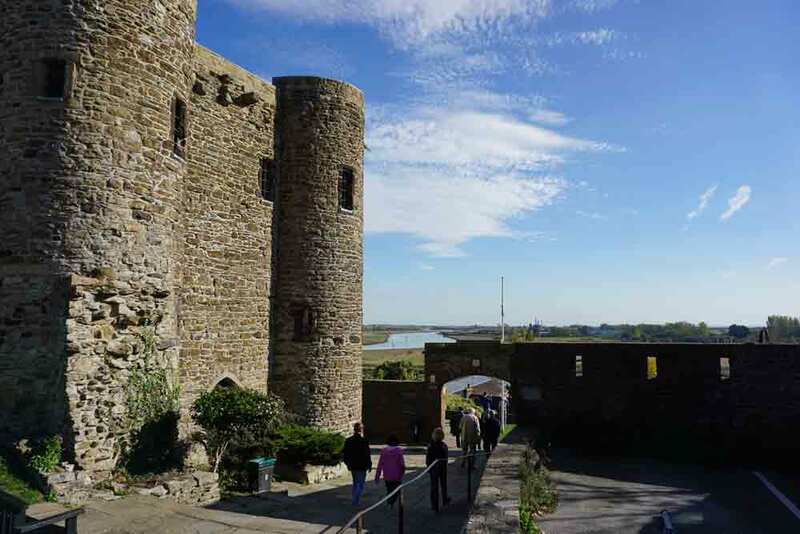 Rye itself is an attractive little town and as one of the Cinque Ports has plenty of history and interesting architecture to recommend it – though the charity shops weren’t up to much! 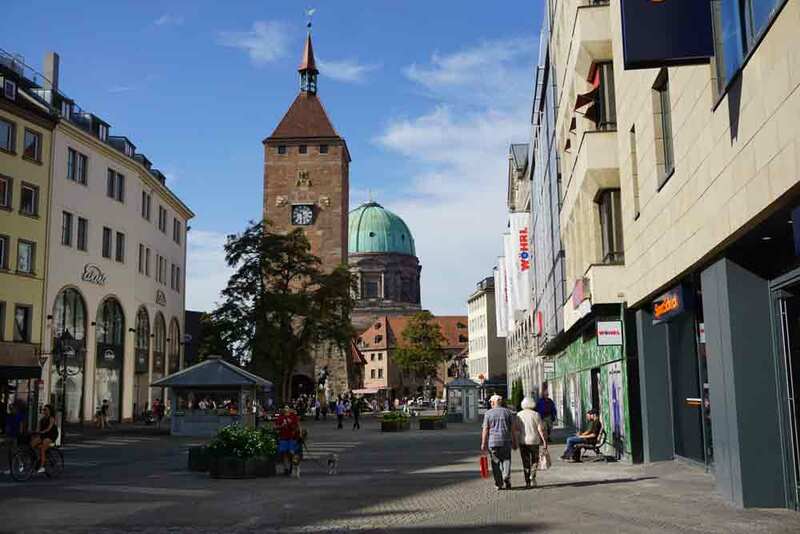 Our visit to Nürnberg at the tail end of September came just a couple of weeks after we’d learned that Richard and Collette had been busy again and were expecting the arrival of identical twins in early April next year. Who says ‘lightning never strikes twice’? By the time of our visit I think that we’d all more or less got over the initial shock, so it was great to spend a little time with them commiserating congratulating them on their exciting news and hearing their plans. It was also wonderful to have a few days with Gretel who unsurprisingly seems to change and grow with every week that passes. For this visit we used Airbnb to book a very nice room in Weilandstraβe which is no more than10 minutes gentle stroll from Richard and Collette’s apartment. We didn’t see a great deal of our hostess, Karin Wittenstein, but she made us very welcome and the room was comfortable and relatively inexpensive, so in all likelihood we’ll use it again for future visits. 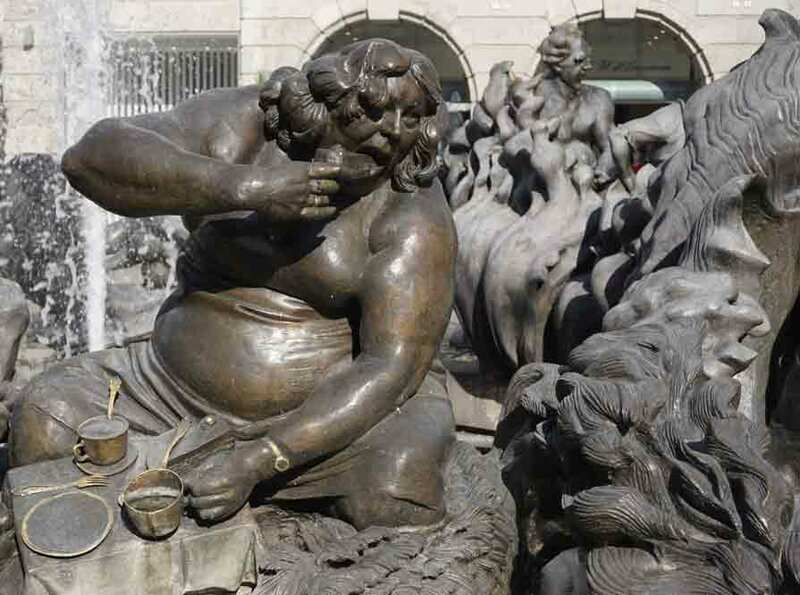 These Nurnberg folk really know how to throw a party! Once again we struck lucky with the weather and had an opportunity to do a bit more exploring around Nürnberg, including a fascinating visit to the building in which the war crimes trials were conducted in the aftermath of WW2. Courtroom 600 and the associated visitor centre provided an excellent and well-balanced insight into the history of the Nazi era, the accused, the trials themselves and the social and political environment in which they were held. 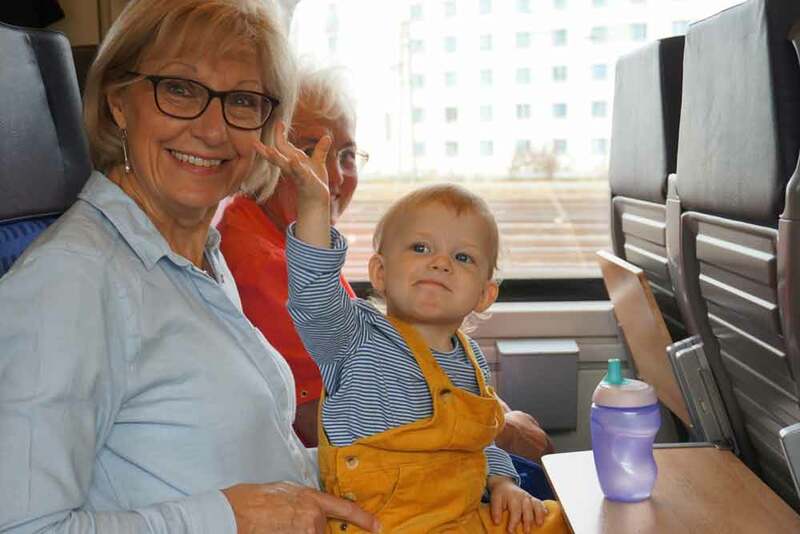 On the Saturday we decided to venture a little further afield and, in company with Richard and Gretel, we let the train take the strain for the hour-long journey to Bayreuth. On the way Denise enjoyed a long and detailed conversation with the German lady who she sat next to – a great opportunity to practise her language skills but quite what they spoke about I don’t think even Denise is entirely sure. Bayreuth itself is a quiet and elegant city and well worth a visit. As we sat in the main concourse enjoying our lunch I was reminded of our life in Germany nearly 40 years ago. When all’s said and done things haven’t changed so very much – the beer and sausages still taste good! 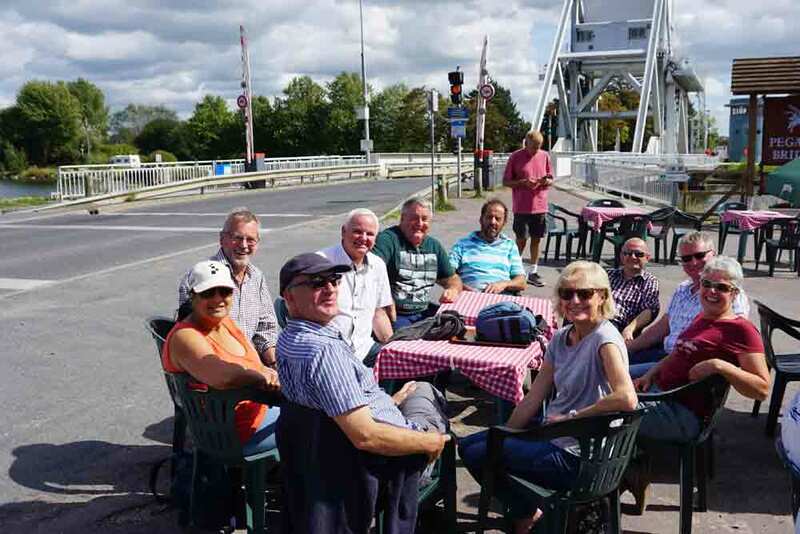 With the summer drawing to a close we were fortunate to enjoy a late spell of really good weather for our recent jaunt to Brittany with a small (and select) team from Gloucester TSSC (otherwise known as the Tufty Club). The idea of an late summer trip to France was mooted about a year ago and as I had somehow managed to stumble upon a group of ex-pat petrol-heads enthusiasts in central Brittany it seemed like a good idea to meet up with them for a ‘cultural exchange’. Early on the Thursday morning fourteen intrepid adventurers in seven cars (The Magnificent Seven?) 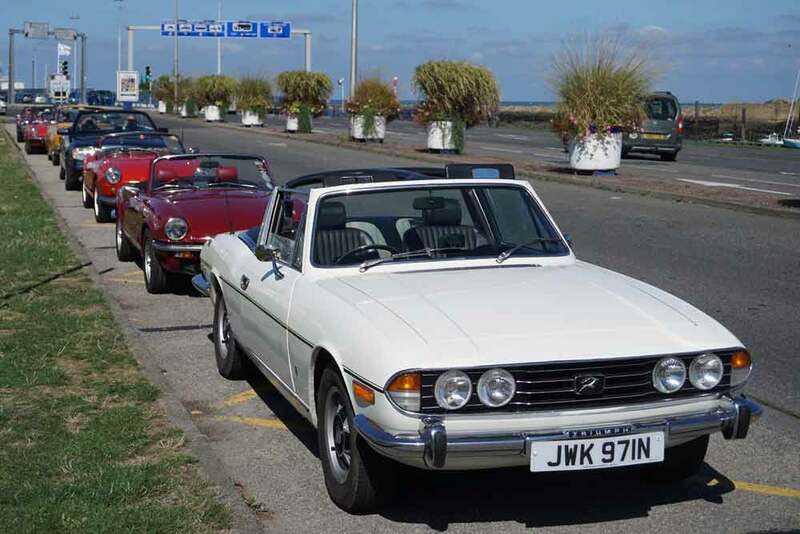 met up at Portsmouth for the short cruise to Caen followed by a 200 mile drive on the excellent and relatively empty French roads to Gouarec, which lies about 80 miles due west of Rennes. Our campsite, which Denise and I had recced earlier in the year on our way to Le Mans, sits on the bank of the Nantes/Brest Canal and is an excellent base for touring the region, albeit its a bit rough around the edges. 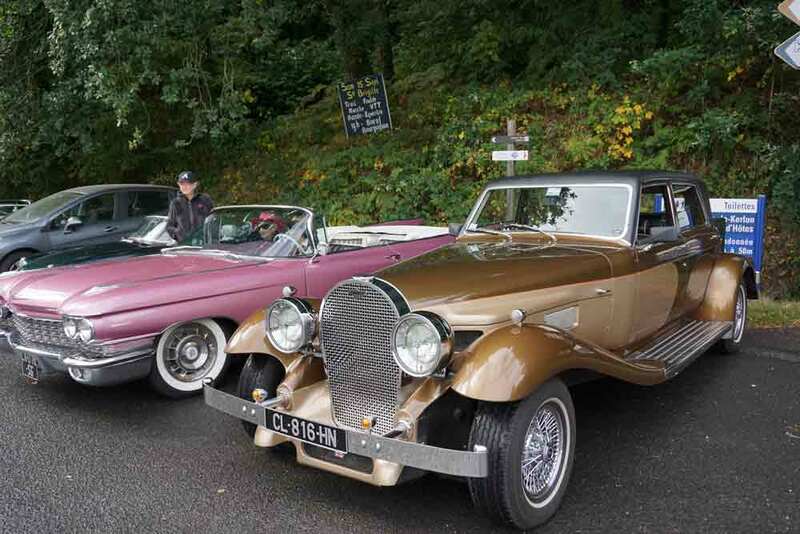 On Friday morning a number of members of The Interesting Car Club arrived at the campsite in their eclectic range of cars to take us on a short drive around the surrounding area before we settled down to a typically Breton lunch at a local restaurant. It was good to have an opportunity to chat with our hosts and to establish a strong connection which may well form the basis for future visits. Saturday was given over to a visit to the Manoir De L’Automobile at Lohéac which is about a two hour drive from Gouarec. 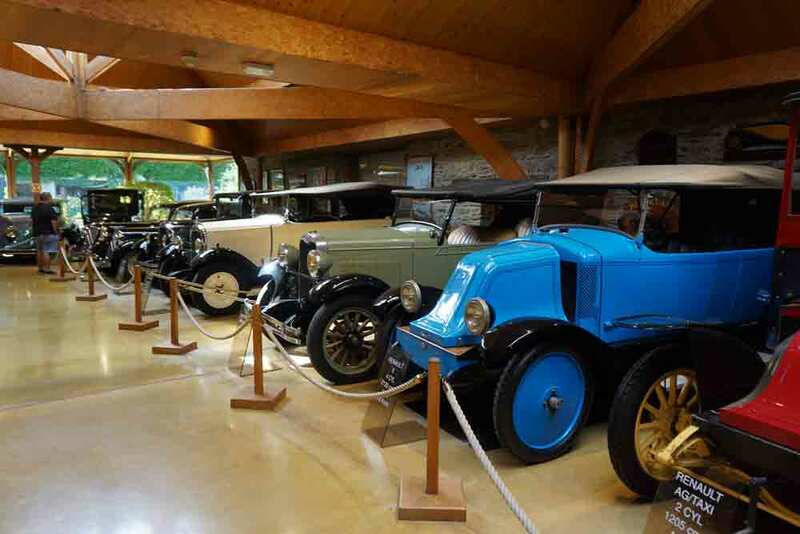 With an excellent collection of more than 300 vehicles of all ages and types its probably one of the best such museums in Europe and well worth a visit. On Sunday some us gave our cars a rest and stayed local whilst others went north to explore the Granite Coast. 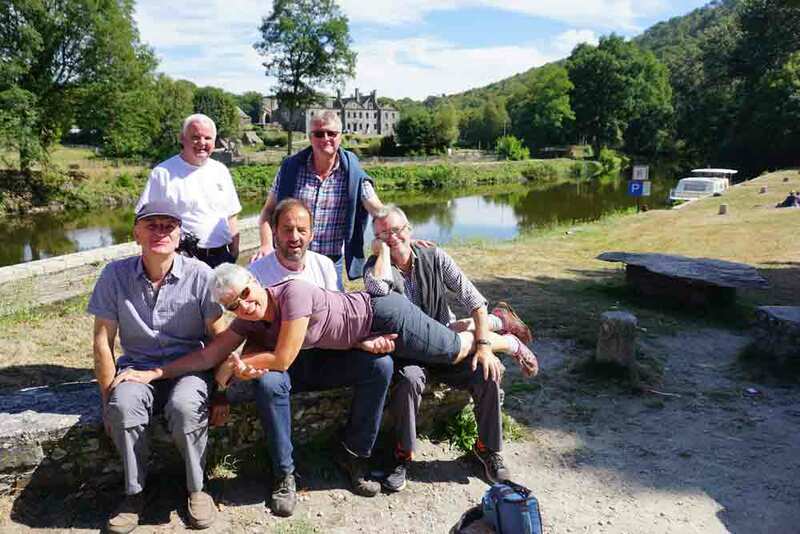 A few of us went back to the Abbaye Do Bon Repos where a stroll around a local market and a short walk down the canal bank were followed by a couple of beers and a bite to eat in a local café whilst taking in a little more French sunshine. Marvellous! We broke our drive back to the ferry on Monday with a short visit to Pegasus Bridge between Caen and Ouistreham . Not having enough time to visit the local museum we opted for refreshments at the small café that sits alongside the bridge – which would have been fine had they not charged €7.80 for a pot of tea! Am I bitter about the ruthless financial exploitation of an historical site where large numbers of British soldiers died in the liberation of France? You bet! Rather than subjecting the van and ourselves to the slow and probably stressful task of climbing over the Alps we decided to make a large investment in the Frejus Tunnel Company which by Wednesday evening brought us to the lovely little mountain town of Aiguebelle just to the south of Albertville. The market square, which should have been our overnight stop, was full of the lorries, vans and enormous caravans belonging to a visiting funfair so, rather than trying to slip in unnoticed, and risking having no wheels on the van when we woke in the morning, we parked on the edge of a small park and passed a peaceful night with just the occasional rumble of passing freight trains to disturb our slumbers. stopped briefly at Nantua, which I’m told is a very pretty, little, lakeside town, but by this stage my cold had the better of me so I stayed in the van frightening passing children with a cough that sounded a bit like a Klaxon. Fortunately the Nantua Tourist Office recommended an excellent campsite at L’Ile Chambod which sits on the banks of the lovely River Ain and provided an excellent location for a couple of days of much-needed R&R – this holidaying lark is hard work! 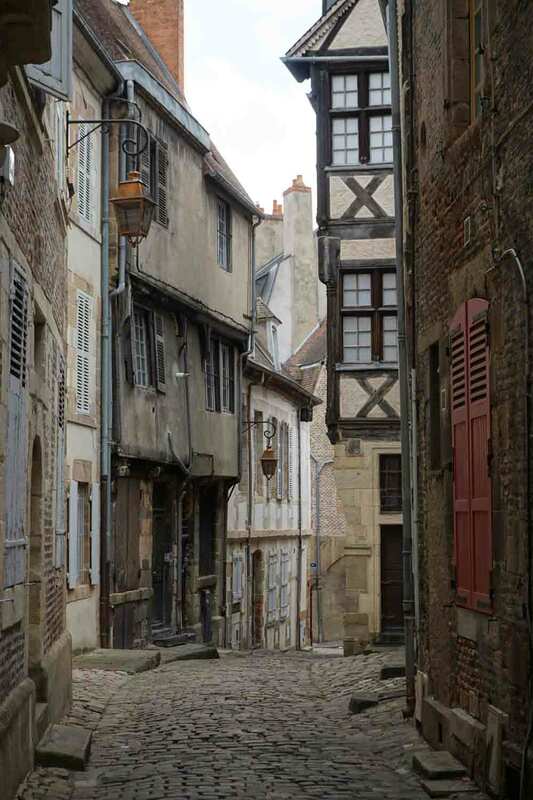 The lovely, and very original, medieval centre of Moulins – the perfect setting for a new production of Les Miserables … only, no singing please Russell! On Saturday we’d planned to visit a local ‘vide grenier’ but for once the weather let us down and we actually had rain – the first proper downpour we’d experienced since before leaving home. 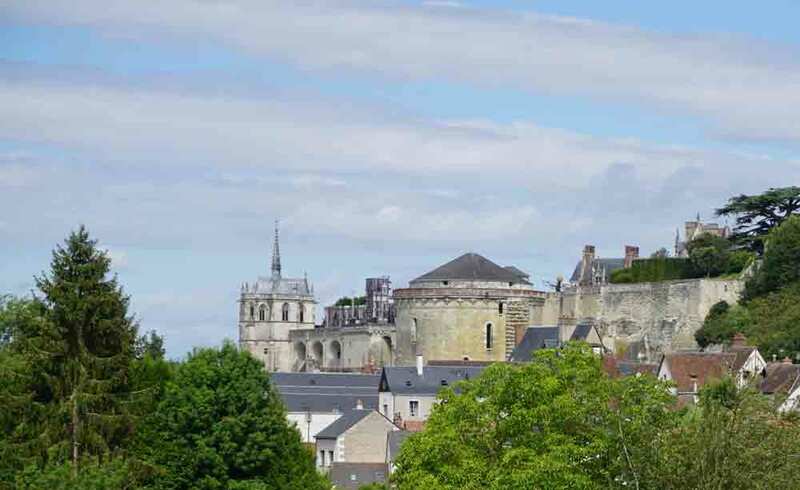 So we decided to get a few miles under our belt and drove for most of the day – through Bourg-en-Bresse, Macon, Moulins and Bourges, finally ending up at Amboise which, by spooky coincidence, just happens to be the last resting place of Leonardo. We spent a morning visiting the Clos de Luce where the great man spent the last three years of his life under the patronage of Francis 1st; lots of interesting stuff, and in some ways better than the Leonardo Museum in Vinci, but I got the impression that the chateau and its contents were more of a re-creation than a restoration. We’d already decided to avoid returning via Genoa at all costs, so leaving Pistoia we headed north towards Modena. By the way, did I mention Pistoia seems to be the garden nursery capital of the world? Forget Dobbies, not a tearoom or soft furnishings area in sight, just field after field after field of shrubs and trees under cultivation all waiting to be shipped around the world to a posh garden somewhere near you. Fantastic! 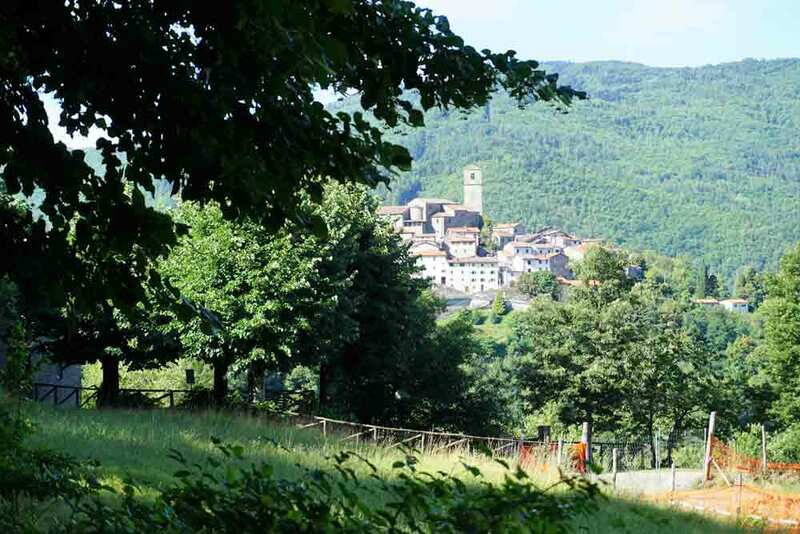 Anyway, our route took us through the fabulous wooded and mountainous backroads of Emelia Romagna towards Modena. One of the problems with driving in Italy is that if you want to get anywhere in a hurry there’s really no alternative to the autostradas. In France if you opt to stay off the toll roads the regional RN roads are an excellent alternative, but in Italy anything you don’t pay for is likely to be slow, crowded and with a road surface that even British highway authorities would be ashamed of. Unfortunately our problem was made worse by Kate who, for the past thousand miles, has been rather too silent for our liking. Now this may be just a girly phase she’s going through, but to be honest a non-speaking satnav with a 12 year old database probably isn’t the most reliable means of navigation currently available. I know that the British Empire was largely founded by intrepid young men clutching copies of their Phillips Modern School Atlas, but there are limits – even for tight-fisted Yorkshiremen. 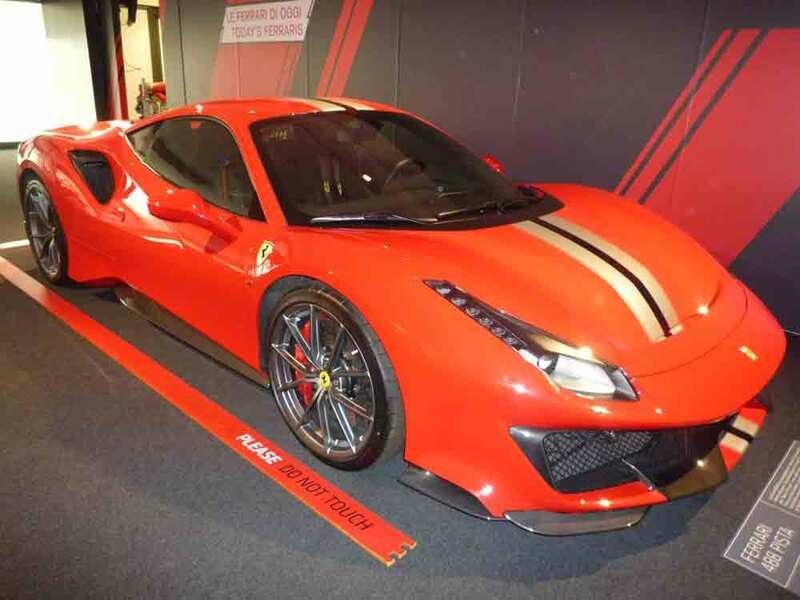 Now just next door to Modena is Maranello which, as the cognoscenti among you will know, is the home of Ferrari; so it would have been rude to pass through without paying homage at the Ferrari Museum. In all honesty I was a little disappointed. Rather too strong on hyperbole and a little short on good ‘man-facts’. You wouldn’t get that sort of show at Aston Martin or Jaguar ………………… much. OK, It’s not quite a Triumph, but I suppose if I were to be offered one …. Next stop was a slightly disappointing and overpriced campsite at Salsomaggiore Terme just to the west of Parma – where the ham reputedly comes from. One interesting fact is that in all our travels since leaving Brittany I don’t believe that we’ve seen any livestock enjoying the benefits of outdoor grazing. Lots of straw being cut and baled, presumably for bedding, but not a single cow, sheep or pig to be seen. It was now Tuesday night and by this stage I was suffering from a bit of a monster summer cold, courtesy of our lovely granddaughter, so was largely taking the role of ‘pathetic passenger’ rather than that of ’ dynamic group leader’. Looking for a campsite in San Damiano d’Asti we found what would have been the perfect location had it not been for the clouds of hungry looking bugs that surrounded the van as we arrived, so we ended up in the carpark of the local cemetery – which we reasoned had been provided for visitors, such as ourselves, rather than residents. 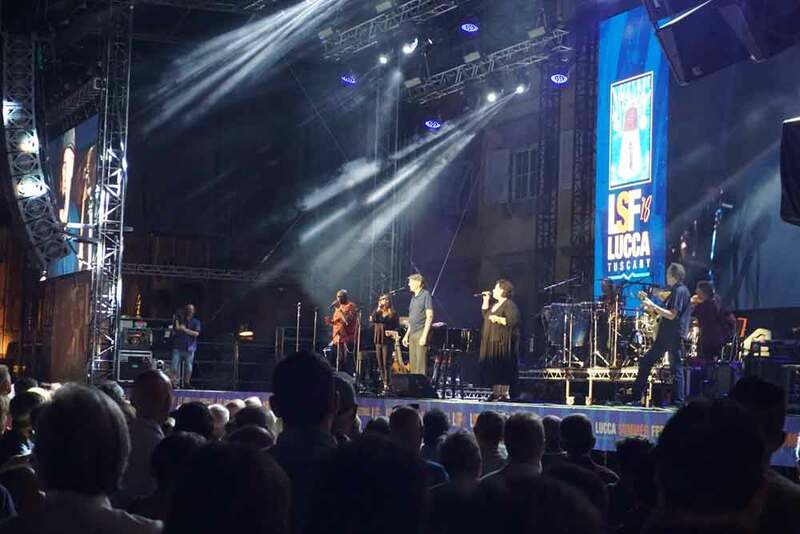 Months ago, when we first decided to have a family holiday in Italy, Jennifer announced that our visit would coincide with the Lucca Summer Festival and that James Taylor, probably the soundtrack of our adult lives, would be playing on the last night of our stay in Vinci. Sometimes in life something comes along that is simply too good an opportunity to miss. Lucca is an ancient walled city that merits another visit when/if we next come to Tuscany. Set in a large piazza in the heart of the city, the concert opened with a lively set by Bonnie Raitt (of whom I’m ashamed to say I’d never heard) before JT spent the best part of two hours singing songs to which even I can remember the words. When dementia finally sets in and you can’t get through to me any other way just stick on a James Taylor CD and I’ll probably be quite content. 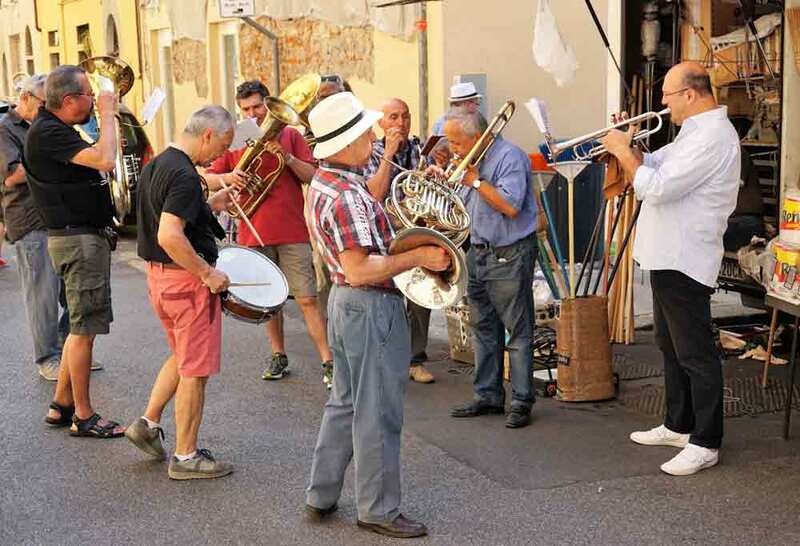 Having vacated Casa Eden on Saturday morning we drove for about an hour up to Pestoia where, after a stooge around the market, we said farewell to Jennie and Nathan who then returned to Pisa for their last night – their flight having been cancelled and their holiday extended by a day. 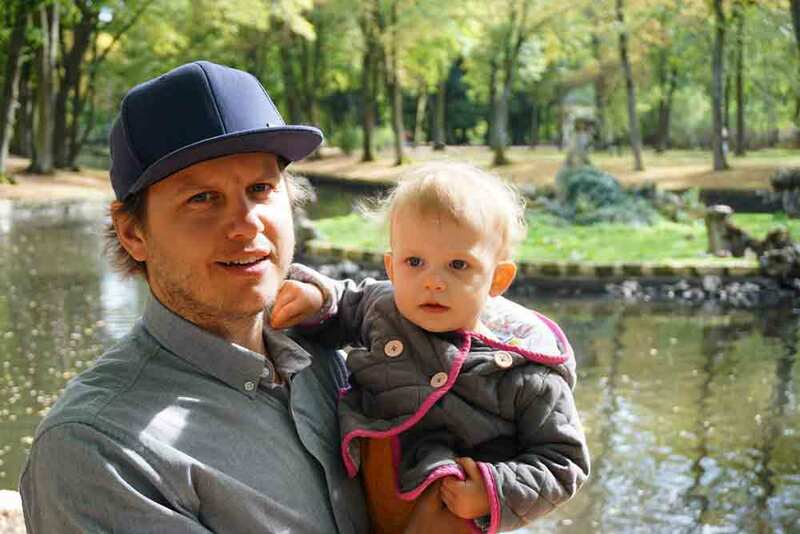 Tom and Emily had returned to London on the Wednesday and Richard, Collette and Gretel drove back to Nuremberg on the Friday afternoon/night so once again we were on our own after a wonderful and unforgettable week with the family. For Sunday we’d booked a visit to Florence’s Uffizi Gallery which is the permanent home to many of the great works of art of the Renaissance period – including some of the very few paintings that Leonardo actually completed and several that he never quite got around to polishing off. It’s a wonderful collection but one could be forgiven (I was) for finding so many similar works from the same period in such close proximity to one another just a bit overwhelming. When in Rome, do as the Romans do. 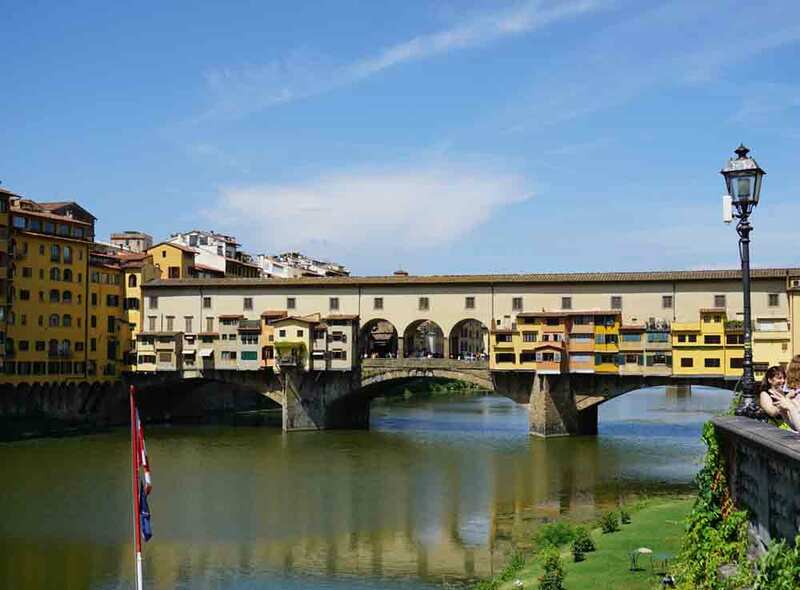 When in Florence … make a point of revisiting the Ponte Vecchio, the Duomo and some of the other famous landmarks that make this city such a great destination for tourists, touts, pickpockets, beggars ….. did I hear someone say ‘bah humbug’? Not me! We spent a couple of nights at a nice little campsite at San Giusto, just a few kilometres from our destination at Vinci. Being early season the site was almost empty and we had a whole section, including a block with four large shower/loo cubicles, virtually to ourselves. 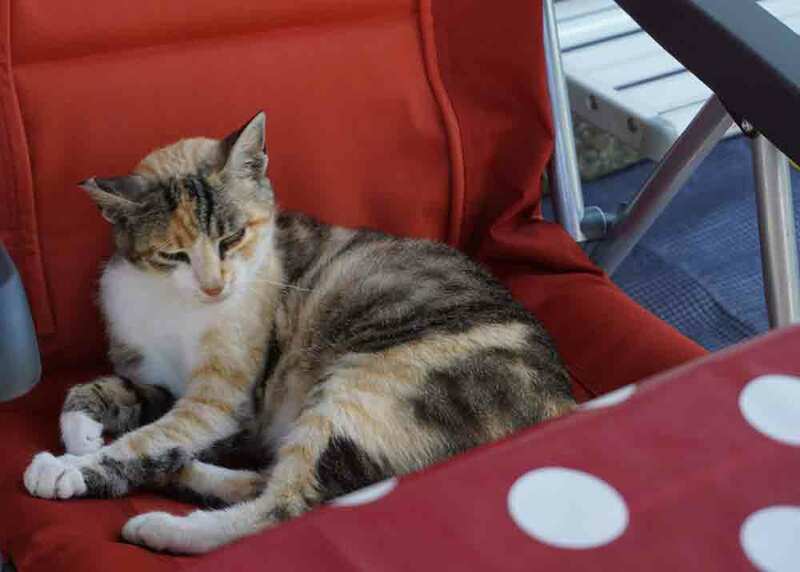 The only other occupant was a friendly little cat which sat diligently outside the ‘van’ for hours on end in the hope and expectation, ultimately fulfilled, of being fed – our first Italian friend. Casa Eden is exactly what we hoped it would be. The villa is a large, six or seven bedroomed house about three or four kilometres outside Vinci, sitting about 300 metres up among the olive groves with great views over the Arno valley. Plenty of room for eight of us, nine including Gretel, with space to rattle around in if needed. The weather continues to be fantastic – temperatures on the early 30s, clear blue skies and the occasional light evening breeze to make the daytime heat bearable. Last night we walked a few hundred metres to the local restaurant – great pizzas at crazy low prices and views to die for – and today we walked down to Vinci to spend a couple of hours in the Leonardo Museum for an insight into the Master’s genius. Our route took us west from Die through the Hautes Alpes to Gap and then onwards, entering Italy just beyond Barcelonette and crossing over the Col del Larche, which at 1,991 metres is probably one of the highest routes in Europe. In the space of less than a hundred miles the scenery and architecture changes from typically French to typically Italian (surprise!) whilst at the same time the road surfaces deteriorate and the standard of driving goes for a ball of chalk. If you’ve still got it – flaunt it! We spent Wednesday night in the town of Borgo San Dalmazzo which generously provides a free space for campervans to overnight next to the municipal cemetery, which is an arrangement that seems to work quite well – at least the residents don’t complain. In the evening we walked into town and found a small bar where they kindly allowed us to watch England being outclassed by a very physical Croatia; our disappointment at the inevitable defeat must have been obvious as at the end of the evening the waitress made sympathetic but completely unintelligible comments (in Italian) and undercharged us for our beers. The drive from Cuneo south and then along the coastline bordering the Bay of Genoa was a bit of a nightmare. Having initially attempted to stay off the autostradas we quickly realised that following the local roads was going to take an absolute age, so we joined the cast of Mad Max hurtling at what seemed like excessive speeds over countless bridges and through innumerable tunnels – a journey that I managed to make considerably worse by first getting a touch too close to a toll booth and then, when we stopped to survey the damage, by reversing into a fence and breaking a rear light cluster. By the way, sodomita is the Italian word for bugger! 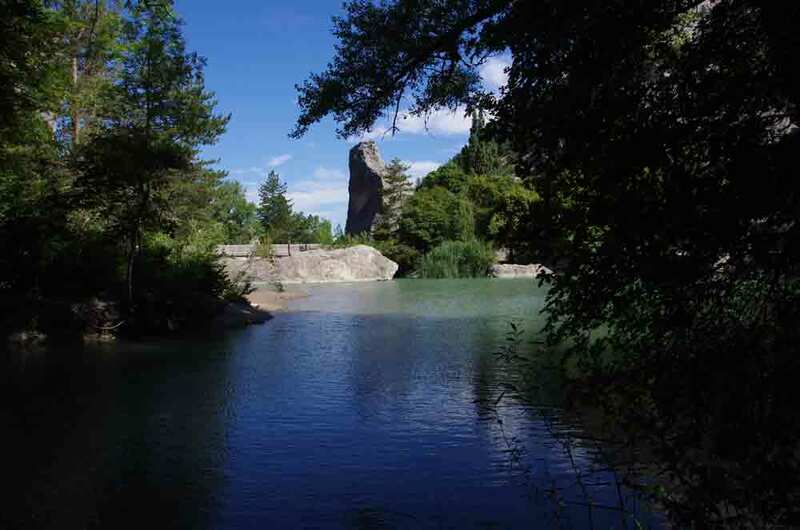 No, the title’s not a prediction, but it just so happens that the second stop in our journey from Le Mans en-route to Italy was near to the town of Die (we still don’t know how to pronounce it) which sits in the Drôme region of France, between the Ardèche and the Hautes Alpes. Our first stop, however, was at the lovely village of Montpeyroux just to the south of Clermont Ferrand. Picked out of our book of free overnight stops we were fortunate to stumble on ‘one of the most beautiful villages of France’ (their words, not mine, but not much of an exaggeration) which, in addition to offering free overnight parking, provided us with a picturesque location with the bonus of free toilets. What more could any weary travellers want? The next day (Tuesday), sticking to the routes national, we headed south-east through the Haut Loire region and across the Rhone, ending the day at the campsite at Die next to the River Drôme. A quick swim before supper and then an hour or so sat in the bar watching France beat Belgium in the company of a partisan audience who didn’t seem to care that their team spent most of the match falling over at every opportunity and then rolling over in feigned agony. Concrete pills needed all round. Despite seemingly performing a complete circumnavigation of the city of Le Mans whilst trying to find the entrance to the circuit, we somehow managed to time our arrival from Brittany to coincide with the appearance of the rest of the Tufty Club who had driven straight from Le Havre – via a good lunch, of course. The TSSC setup at Tertre Rouge is the envy of many other clubs who eye our location, loos, showers and bar with more than a touch of ‘green eye’; and the Gloucester group is especially well served by having a couple of self-elected resident chefs who ensure that the rest of us don’t starve over the three day event. Our activities over the long weekend followed a now well-established pattern which included a jaunt into the city on Friday for a good lunch, a trip around the club areas and retail park on the Saturday and a visit to the paddocks on Sunday. In the intervening hours we watched a fair bit of racing, including the Le Mans style start for the Group 1 racers (cars from the 1920s and 30s) and several sessions involving some of the later cars. As 2018 happens to be the 70th anniversary of Porche first appearing at Le Mans the meeting included large numbers of Dr Ferdinand’s best, both on the racetrack, on the club stands and just about everywhere you cared to look around the circuit. Although personally I can’t see the attraction of paying upwards of £160 for a couple of track laps (and in truth I’m not sure the organisers would have appreciated having a Ford Motor Home thundering down the Mulsanne straight flat-out at 65mph) I do understand the motive of those who enjoy beasting their beloved classic whilst at the same time hoping that it doesn’t disgrace itself too publicly. This year the only significant Gloucester casualty was a very nice Staaaag which decided to commit hari kiri at the far side of the circuit and had to be recovered back to the campsite – much to the evident amusement of all the onlookers. Still, what are friends for? At least the resident bishop (Dave Hardy in clerical drag) didn’t go so far is to administer the last rites.